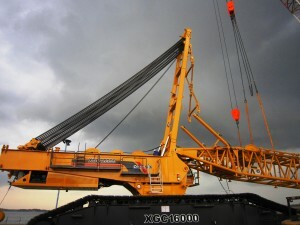 Chinese crawler crane manufacturer XCMG says an order for an XGC16000 (1250t) from an Indonesian customer is putting it on the map in terms of kiloton Chinese crawler crane exports. The crane will be used by the customer from August in lifting offshore drilling platform equipment. XCMG said the successful export was of strategic significance to XCMG and marked a further step for the company in accessing the international market. The XGC16000 has a maximum lifting height of 202m and maximum combined length of boom (96m) and tower jib (108m). XCMG said more and more Chinese crane companies were planning to expand their international business, with an acceleration in technological improvements to target foreign customers, who are gradually accepting high-tech Chinese construction sector machinery.